Have you Been seriously injured in a distracted Driving accident? Distracted driving is any activity that takes your attention away from driving. When a driver is distracted, he or she may not drive a consistent speed or control the distance to the car in front or may drive erratically, swerving in his or her lane. Auto industry studies have generally concluded that a driver should not have their eyes off the road for more than two to three seconds. Questions? Call us today at (877) 284-6600 and talk to one of our knowledgeable staff. As of March 2019, 16 states and the District of Columbia had banned drivers from hand-held phone use and texting while driving is banned in 47 states and the District of Columbia. Two additional states ban texting while driving for new drivers. 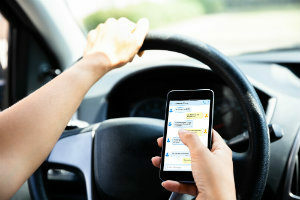 Missouri texting and driving laws state: only novice drivers, those 21 and under, are prohibited from texting while driving. Missouri’s novice texting laws and CDL anti-cell phone laws are considered “primary” laws. A primary law means that an officer can pull a novice over for the offense without having to witness some other violation. Whether you are a driver, passenger, or pedestrian injured in a distracted driving accident, you need a trusted car accident attorney in Kansas City who is knowledgeable and well versed in investigating accidents. Serious injuries, sometimes fatal, can result from distracted driving accidents. Some injuries may require immediate treatment, while others may require long-term treatment. Our car accident attorneys have represented hundreds of victims. Our car accident attorneys know what to look for at a crash site in order to build a case that addresses your full range of injuries. Our legal team will substantiate your financial needs and, throughout the process, they will provide you with personal attention. Call us today. Our knowledgeable staff is available at (877) 284-6600. If you have been injured by a distracted driver, let the attorneys at Nash & Franciskato help you obtain the compensation you deserve. In the Kansas City area and across Missouri, the Nash & Franciskato Law Firm will fight for your rights. Contact us today for a free, no-obligation evaluation of your case.